What's included in my license? If you would like to access all purchased licenses, you can go to your Account Licenses page. All Formidable Pro and Formidable add-on licenses that have been purchased will be listed. If your license is currently active, you will see something similar to the image below. If your license is currently expired, you will see something similar to the image below. 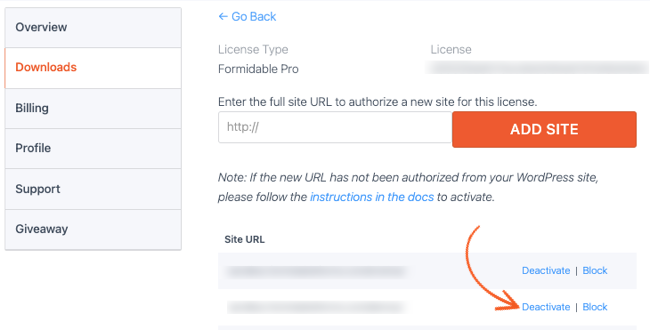 If you have purchased Formidable and are looking to activate your license on a site, please follow the license activation instructions. If you have purchased an add-on, you can go to the Formidable Global Settings page in your WordPress admin dashboard, and then click on 'Plugin Licenses.' After doing so, you can click on 'Autofill Licenses' which will automatically retrieve your add-on license keys. Once your license is activated, you may want to see which sites your license is active on, and possibly even deactivate your license on one or more of those sites. To manage the sites that are on your license, go to the Account Licenses page and click 'Manage Sites' on one of your purchased items. This will bring you to a page where you can see which sites your license is activated on. You may deactivate your license from any one of the sites. The 'Manage sites' page for deactivating a site can also be used to block a site. Go to the Account Licenses page and click 'Manage Sites' for one of your licenses. Then click the 'Block site' link. This will add the site to a list of Blocked Sites at the bottom of that page. Any site you block will be blocked from all of your licenses. If you need to unblock a site, go back to the Account Licenses page and click 'Manage Sites' for one of your licenses. Click the 'Unblock site' link for the site you no longer wish to be blocked. Each license on your Account Licenses page includes a link to renew. This link will allow you to renew to access the benefits of an active license for an additional year. For example, if today's date is June 1st, 2016 and your license is due to expire on June 30th, 2016, when you renew your license, the new license expiration date will be June 30th, 2017. To find out more about upgrading your license, click here. If you have subscriptions on your account, the will be listed at the top of the purchases page. This will list each subscription along with the date it will next be billed. Active subscriptions include links to update the payment method and cancel the subscription. You can download zip files for Formidable Pro and any add-ons you have a license for. You can see all of your purchased downloads on the Account → Downloads page. Click on the download link for a plugin and it will begin downloading. Since v3.04.02, after Pro is installed and activated, there is no need to return to your Account Downloads page. You can instead go to the Formidable → Add-ons page your WordPress admin area. If you have issues downloading or installing Formidable Pro or an add-on, please follow these instructions. If you still have trouble, feel free to open a support ticket.